One of my pistons sticks out a lot on my elixirs compared to the other. Is this normal? my guess is that the brakes we mounted a little off center causing one piston to have to travel farther to hit the rotor. is the other piston in more than the pistons on the other brake? I wouldn't get too excited about it as long as the air gap is equal and the pistons move out equally when the lever is pulled. If it's really bugging you, push the pistons all the way back into the caliper and start all over again. Minor frictional differences between sides will ALWAYS cause each side to behave differently. It's no big deal unless the difference has an adverse affect on brake performance. Here, i attached a picture to show the issue. 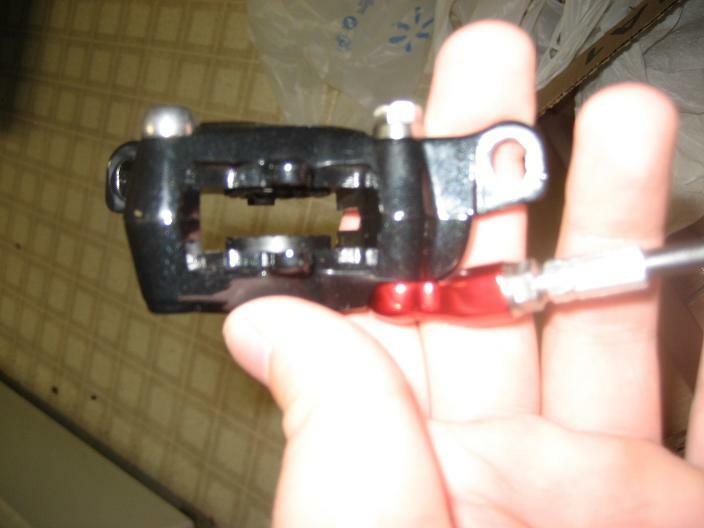 As you can see, in relation the the sides of the caliper, one piston sticks out a lot more. It won't go in any further from me pushing it however. Hope someone can answer this one. You might have mounted it a good bit off center like someone else already mentioned. When you pumped the lever the pistons adjusted accordingly. Another option is a sticking piston. If that is the case then press the free moving piston back in and secure as best you can. Gently squeeze the lever until the sticky piston breaks free. Then apply a few drops of Triflow to the sticky piston and press it back down. Repeat the procedure which will move the sticking piston back and forth letting the Triflow lubricate it. Finally use compressed air to blow away any excess Triflow before reinstalling the pads and the wheel. Ok, i don't think i fully understand the responses. The lower piston from the picture sticks out about 1/4" from the base of the caliper. The upper piston from the picture sticks out about 1/16" from the base of the caliper. Is this normal? I have tried to push the lower caliper further in but it will not budge. This is what is causing some of my brake rub. you have to push it back in... no it's not normal. i install an old set of pads and pry them apart with a screwdriver, it works well. Wow alex, i am stupid. I was trying to push it in with a screwdriver without the pad. Of course spreading out the pressure would help. Thanks a lot, should be able to get these things up and running. lol you not stupid, but installing old pads is just so you can pry the sh*t out of them without harming the pistons if need be. report back when ya get them working! The piston will eventually go back in. It just might take a lot of pressure. it helps if you have a bleed kit. Install it dry and then press the piston back in, fluid will exit through the caliper syringe, once it's compressed, install a bleed block and push the fluid back in. Better yet - clean piston with some Iso and a Q-tip, then apply DOT fluid on the exposed piston before pressing the piston back in. This is precisely why Avid's CPS caliper "alignment" method is so poor. How about this stuff - bike shop suggested it to me and I find it works well. Not trying to hijack the thread and expect no replies but - no, I didn't take their advice then buy online. You have a solid case of sticky piston. You can attempt to fix it yourself, however you must use DOT fluid only, not any other kind of lubricant, as the seals can be damaged (as mentioned above), you should push the piston out a tiny bit, apply a small amount of DOT fluid, push it back in (all the way back in), and repeat - you will want something like a cone wrench to do this, and can be careful pressing on the pistons or use an old set of pads. If you don't have DOT fluid and aren't sure about all this, take it to a good LBS! There's a 50/50 chance the lever body needs to be overhauled, unfortunately, sometimes one of the seals just isn't right, etc. Your not all mountain unless your runnin' crushed dew cans..
What? theres nothing wrong with it, you calipers have to be working properly for it to work, but that doesn't make it a poor system. The problem is with the caliper... not the lever. The lever is obviously making pressure and moving fluid, as it is able to pump out one piston. The other piston is probably just sticky. Pump it out, clean, lube with DOT fluid, work it in and out. Exactly. It's entirely possible that the OP's problem has been there since the brake was installed, and that it could have been avoided had the caliper been set up visually and a minute or so attention paid to ensure that both pistons extended fully. It's very common with new calipers that one piston will extend quicker than the other. That fast-moving piston is then determining the permanent position of the caliper and, in the worst case, the total non-movement of the other piston. Last edited by SteveUK; 11-25-2009 at 05:48 AM. It seems symptomatic with Avids to have a dominate piston. I've noticed this with my Elixirs and Juicy's, though not as exaggerated as this. Alignment for Avid's needs to be done in steps, not just squeezing the lever and tightening the bolts. You have to do a gross visual alignment first, center the caliper by eye, then squeeze the lever and tighten....recheck and spin the wheel to see if it's centered. The thing impressive about my Magura Marta's is the very even piston movement, both side are always in unison, nice! jabone, did you get the problem resolved? Not trying to hijack the thread, but I seem to be having a similar problem on my elixir r's. I just installed them and the rear brakes seem to have unequal pad movement. The outboard pad never moves as far as the inboard pad. They're brand new so it seems that after getting some miles on them they might get to look just as bad. Also the lever feels funny. its not exactly a slow return so much as a delayed return. it seems to wait just a fraction of a second to start to return to its original position at full speed. there's also a very strange noise coming from the lever when squeezed, it sounds like bubbles or something moving around within the lever body. I bled the system and the dot fluid that came out was a much darker color than the new one, of course there were a ton of bubbles in the system. I haven't really put in any time on the brakes so they're not broken in, I cant comment on performance yet. anyway my story. I think the uneven piston movement is just the way Avid's operate, I noticed the same on my Elixir CRs before installing, and Juicy 7s prior to these. 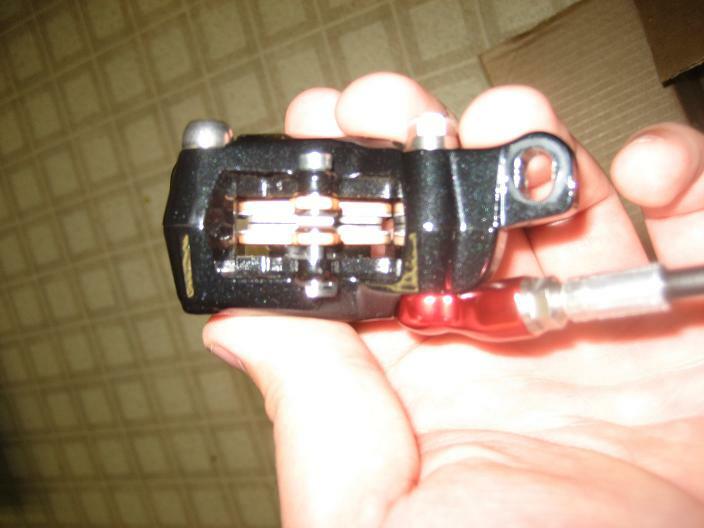 I just bought Magura Marta SL's and checked the piston movement, equal from both sides, nice to see. Looking forward to comparing them to the Elixirs on the trail. Pretty sure the Elixrs use a design that pushes the fluid to the outside piston first, then to the inside. Makes for a slightly uneven response, but not awful. Magura uses a balanced design, pushes the fluid to both pistons at the same time, and same rate. At any rate, the simplest way to fix the OP's problem is to just loosen the bleed screw, wrap a towel around the lever to catch the fluid that's going to shoot out, and push the pistons back in........both of them. Trying to push a piston in with the bleed screw closed is like pushing an elephant up a flight of stairs. Just remember to refill whatever fluid comes out. Shouldn't be a whole lot. Then center the caliper by eyeball, as close as possible on the rotor, squeeze the lever, and tighten the CPS bolts nice and tight. Not super-strong-pushing-your-legs-against-the-wheel and using both hands tight, but enough it won't move. Use a little LokTite if you want to be sure. I like the CPS system, always have. One of the only ones that compensate automatically for an uneven IS mount. Also the lever feels funny. its not exactly a slow return so much as a delayed return. it seems to wait just a fraction of a second to start to return to its original position at full speed. I noticed this with my Elixir CR Mag's right as soon as I set them up. It went away on mine with just a little use - like wheeling around the shop, and during my fit set-up. Just squeeze the lever a couple dozen times, or go for a ride.